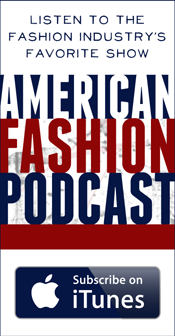 : New York Fashion Week "In the Market Reports"
New York Fashion Week "In the Market Reports"
She’s Not Getting Older, She’s Getting Better! 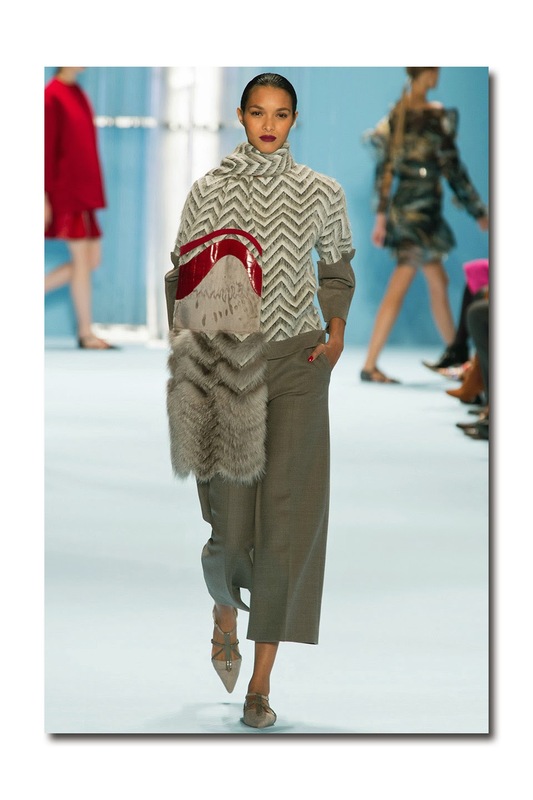 Carolina Herrera held her Fall 2015 show, yesterday at the Tents at Lincoln Center, and it was one of her best yet. I know we’re at a moment in time when (thankfully), the mature, older woman is being celebrated, and age is becoming (or has become) irrelevant, so please ‘ forgive’ me for using the “Y” word (youthful), but in fact, the 76 year old’s collection, while elegant (as always) had a wonderfully youthful spirit. In part because the overall mood was happy, upbeat, and optimistic; and in part because the models had their hair pulled back in ponytails and moved quickly on the runway in their flat shoes and flat boots, which added a feeling of youthful ease and unfussy informality. The collection was filled with Herrera signatures (the always luxurious fabrics and furs, the beautiful sense of color, the tactile embroidered embellishments; the gorgeous evening wear, etc.) and it was a good example of the way being conceptual and artistic, can actually work for a fashion designer, and not backfire, with the end result looking forced, clichéd, or hackneyed. Whereas last season, Ms. Herrera’s concept was flowers, this time around, it was water, and it served as inspiration (literally and figuratively). You could see it in the color palette (blues and grays); the patterns (silk clouds, deep water, water drop, and ripple prints); the use of cascading fabrics; and the general idea that the clothes would float on the body. As for the artistry part. Let’s just say that Ms. Herrera was awarded The Couture Council of the Museum at FITY’s Artistry in Fashion Award this past September, and she continues to prove herself a worthy honoree as there were artistic flourishes throughout (specifically, the painterly prints and patterns; the acrylic embellishments). 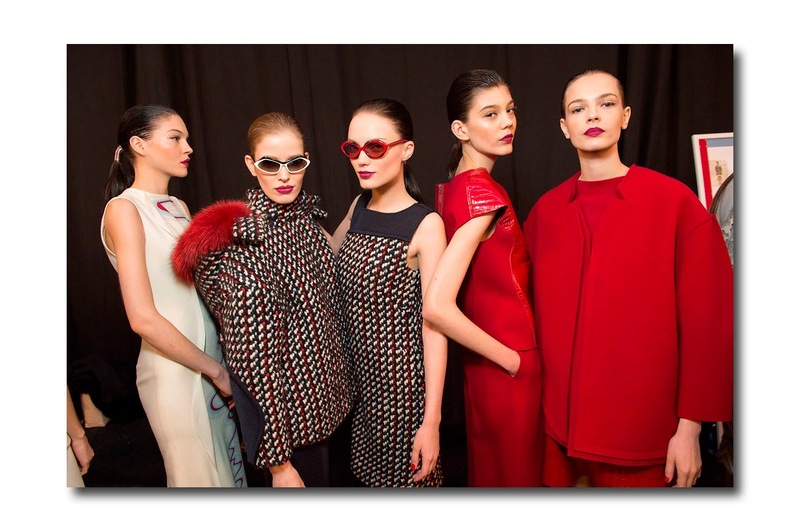 By the way, while Ms. Herrera is admittedly known for her fabulous evening dresses, which find their way on many of the Best Dressed women at high profile soirees, her daytime offerings (the pieces in multi-color knit; the deep red wool felt coat and sweater with alligator skirt; the deep red alligator ‘t shirt’ worn with red wool felt cropped pants; the dew gray houndstooth and chevron coat with red acrylic embellishment, the duo of scarves trimmed with fox and broadtail) were also strong. 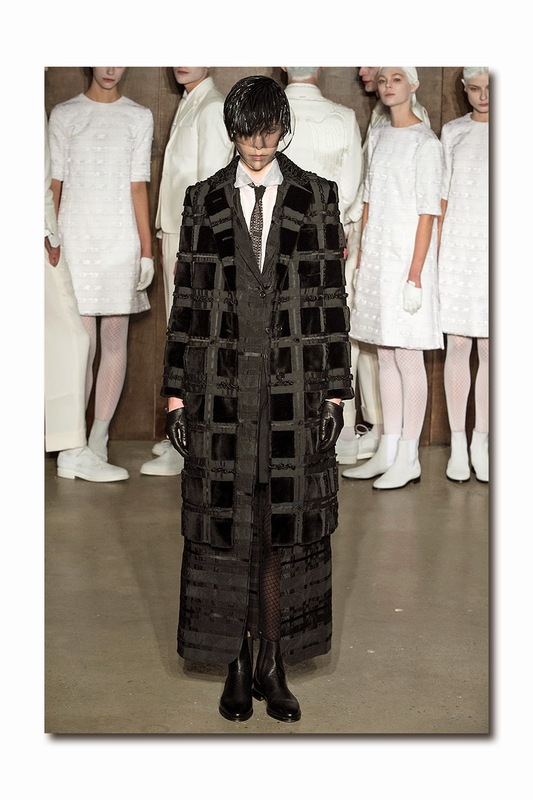 You never know what you’re going to get when you go to see a Thom Browne show, but the guy definitely has a preoccupation with the Catholic Church, death and institutions, so you know it will be bizarre. Who could possibly forget the models in coffins at the New York Public Library a few years back? And what about the show that was staged to resemble an insane asylum? 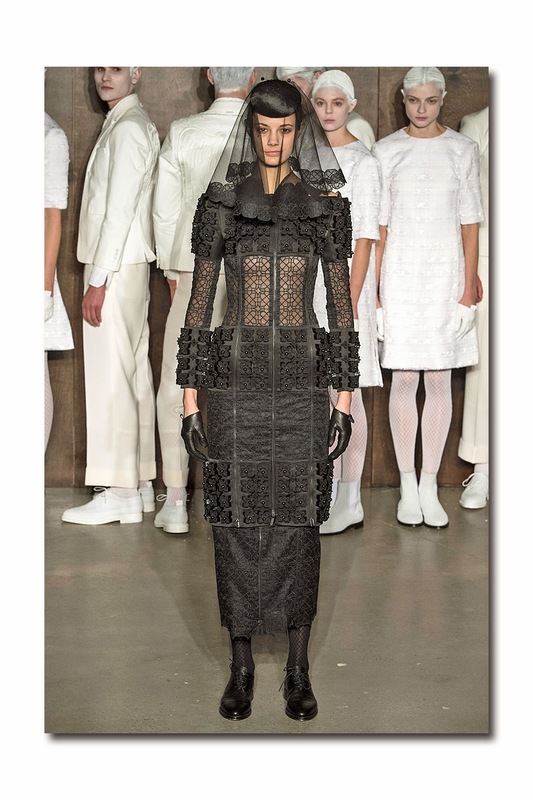 Or last year’s homage to the nuns, during which time the venue was turned into a church? 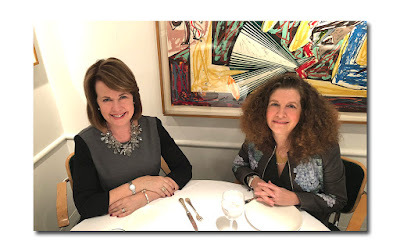 Soon after taking my seat inside Skylight Modern on West 27th Street on Monday night, it was obvious it would be yet another one of his signature presentations (they can easily rival an Off-Broadway or Broadway production). The guests were arranged around three sterile ‘operating rooms’ complete with the overhead lights one normally finds in hospitals (we were in the viewing stand). In each, there were two male ‘doctors’ dressed in all white, tending to a woman, (also dressed in white), who was on the operating table and apparently ‘dying’ of a broken heart. But alas, the doctors could not save her, the patient ‘passed away’, went on to heaven, and was taken out of the room. But not before the ‘doctors’ removed their pristine white jackets, folded them precisely, and placed them on her body. It was then that the show began: she was mourned by her very chic, black clad friends, 40 in all, (they comprised the 40 piece lineup). 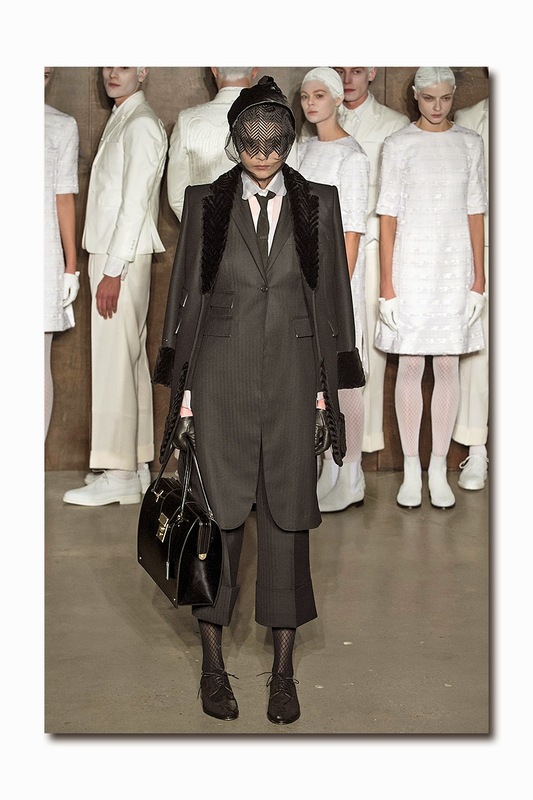 If you’re thinking the collection was somber and funereal, think again. It had its moments of decorative gaiety thanks to Thom’s superb fabric mixes (silk satin, silk gazaar with woven grosgrain embroidery, boiled wool, silk moire, wool boucle, kid mohair, silk chiffon ottoman, guipure lace, sheared mink, astrakhan, etc. ), and his use of trims (bugle beads, feathers, beaver) to create surface interest and texture (and a bit of welcome shine here and there). The Dennis Basso Show was held at the Theatre in Lincoln Center on the coldest day of the year in a boiling hot room, with photographers paradoxically grabbing for water on this frigid afternoon. Basso, 59, who is a furrier to socialites and celebrities is also a close personal friend to the elite in New York and appears as a regular on the charity circuit. The crowd was replete with Basso clients including Mary J. Blige, Coco Rocha, and socialites Fe Fendi, Nina Griscom, Hal Rubenstein, Alexandra Lebenthal, and many others. Basso, 59, started his business in 1983 after selling a line of pelts out of the trunk of a rented town car. His furs are legendary for their luxuriousness and hefty price tags. Moreover, he has become an increasingly sought after designer of gowns for starlets, recently designing Gabrielle Union's gown for her wedding to Dwayne Wade this past September. The fall/winter 2015 collection was inspired by the glamour of the 70's with a modern twist on the jumpsuits, tunics, palazzos, and bias cut halter sheaths. The chinchillas, sables, foxes and broadtails appeared in hues of gold, grey and camo and were typically lush and elaborate. One thing that is evident from a Basso show is his meticulous attention to all aspects of the event ranging from the hair and makeup of the models to the accompanying music and run of show.The show opened with a champagne velvet hand-embroidered gown and Russian Lynx coat; this look was my least favorite as the dress was ill fitted and tawdry, hardly worthy of a Basso gown. 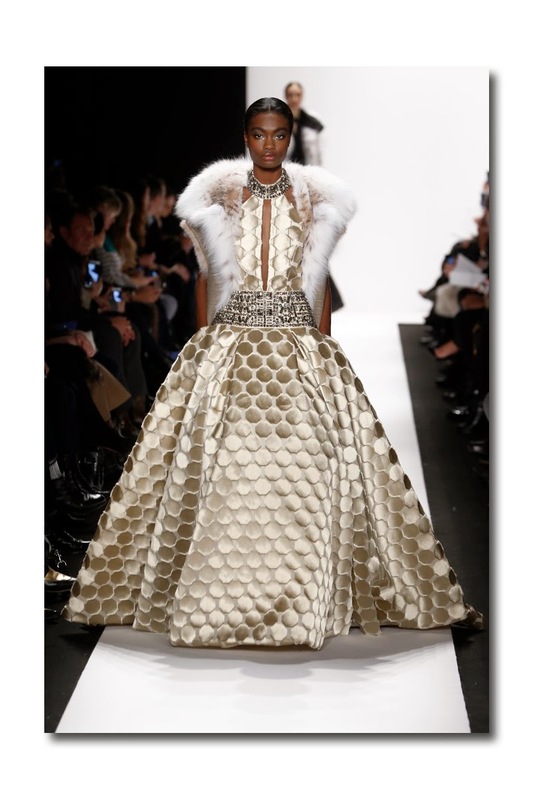 Thankfully, the gold dresses which followed were signature Basso with an elegance and vibrancy that astounded. The gold broadtail and fox coat was executed to perfection especially when accompanied by a bias slip, which lent the look a bedroom vibe that is rarely seen with furs. 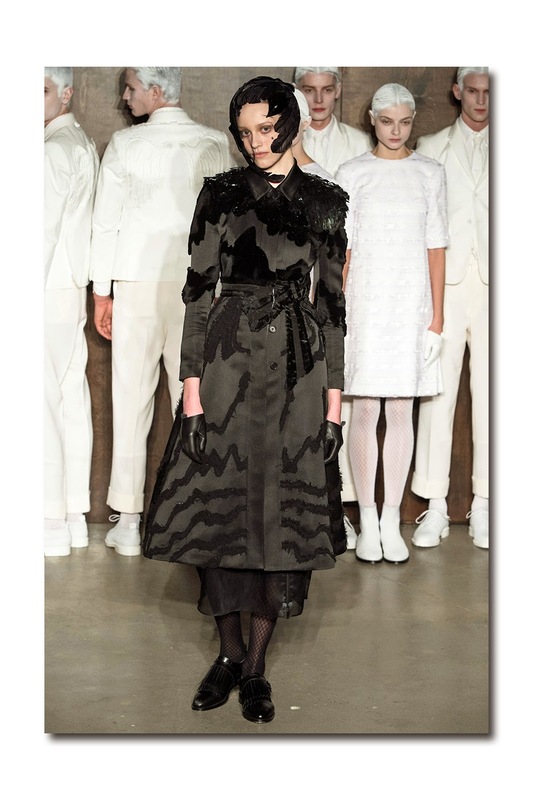 The use of bias slips throughout gave the collection an ease and provided an interesting contrast to the bulky furs. The pale gold hand-embroidered gown, accompanied by a Russian lynx and alligator vest, was a favorite for its delicacy and beauty. The next dresses and pants in black coupled with sable and mink were opulent and understated with an effortless elegance. The utilization of midnight navy in the gowns and pants was a nice change especially when coupled with a matching navy fur. The gowns in scarlet and plum lacked the wow factor of prior collections and frequently got lost when matched with an inappropriately colored fur such as brown or red. The introduction of lavender was simple and pretty without any dramatic effect and was followed by some bold block print and hand embroidered gowns with chinchilla and fox camos. These looks were bold and somewhat dizzying but a welcome variation from the blandness of the previous looks.
. Basso's decision to end his show with gowns as opposed to furs was indicative of his confidence in this new genre. Basso has learned how to perfect the gown and is no longer just a couturier furrier-he is now a master of evening wear.